Last year Barnes and Noble introduced The Nook. I’ve been using the Kindle 2 until my husband took it away from me because his broke. (ok, he didn’t take it, I gave it to him because he has trouble falling asleep and reading helps him.) We switched to a digital reader because my husband goes through books like the wind blows and he doesn’t like the library. He’s a little weird, so overall, it’s cheaper for us to use a digital reader. It’s also a lot easier because when he unexpectedly can’t go to bed one night he can just purchase a new book and it is instantly there. Opening the Box: I found the packaging easy to open and sharp! The Nook is an ebook reader that allows you to read your books no matter where you are. That is an advantage over the Amazon Kindle. The Kindle does not share except with other Kindles within the same account. So my husband and I do share books, but with the Nook, I can share my books with anyone anywhere. 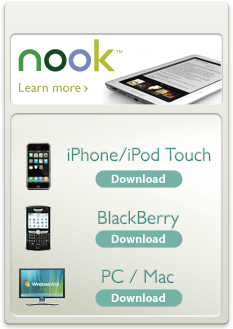 If you have an iPhone/iPod, soon to be iPad, BlackBerry, and your computers, you can swap books from the nook. Another advantage is the color touch screen that is just below the reading area. At first I thought the reading area was smaller but it is the same size. The touch screen is quite nice and easy for me to use. You can view by cover art. My husband said I need to warn you that not all book covers that come up are suitable for kids to look at. He probably was looking at Sci Fi books just to let you know. The combination of color and touch on the beautiful lower screen make navigating nook intuitive and simple, even for the tech novice. nook presents the controls, navigation and keyboard you need, only when you need them. Another advantage is you can change the screen saver and choose some very fun ones to look at. They have an Alice and Wonderland that look really cool. I’m just sad that I have to download it onto my computer then over to the nook, but they might work on changing that option. We’ll just have to wait and see. My only complaint would be that the Nook is slow compared the Kindle. Directly downloading a book that we were trying to purchase took a little more time than we liked, but it’s still so much faster than going out to the store, esp since stores aren’t open when we are looking at getting a new book. Tell me what will be the first book you download to read when you win. The contest will run until March 24th 11:59 pm Pacific. All rules can be found under giveaway rules. I would first download “Secrets of Eden” – the new one out by Chris Bohjalian. I loved his first book so I’m looking forward to the second. by Kristan Higgins. A friend just finished reading it and loved it. I favorited you on Technorati (as katygmorris). I submitted this post on Digg (as katygmorris). I Stumbled this post on StumbleUpon (as katygmorris). I would get Beautiful Creatures by Kami Garcia to start! There are so many books that I want though! Thanks for the chance. share on my son’s blog. I just posted this giveaway on Connie’s View for you. It’s number 88 and 89! I’m interested in getting The School of Essential Ingredients by Erica Bauermeister. I would download Shutter Island–I heard it was amazing! I’d download The Girl Who Kicked the Hornet’s Nest by Steig Laesson. I’d download Steig Larsson’s The Girl Who Kicked the Hornet’s Nest. The first book I would download is Outlander by Diana Gibalan. I would download “The Lost Symbol” by Dan Brown. I love his books, and can’t wait to read the newest one, but without the weight of a hardcover book! I think the first book I’ll download will be “Blue Like Playdough” by Tricia Goyer. Probably the Bible. I’m always reading/always need it. I think I’d download House of Many Ways by Diana Wynne Jones. Or possibly the 4th Percy Jackson book. Or maybe Alice in Wonderland. I subscribe to your blog via RSS feed on my iGoogle homepage, and that’s how I found out about this giveaway. I stumble’d the giveaway. My userid over there is “anthy,” too. entry #1! I stumble’d the giveaway. My userid over there is “anthy,” too. entry #2! I dugg the giveaway on Digg.com! (It’d already been added, but I thumbed it up? Hope that counts. I’m anthyq over there.) Entry #1! I dugg the giveaway on Digg.com. Entry #2! I would love to read the Last Song by Nicholas Sparks!!!! I would downlowd that new book The Help. I’d really like to read Dan Brown’s Lost Symbol. Pride and Prejudice – love that book! I would read Unseen Academicals by Terry Pratchett first. Definately Nicholas Sparks – The Lucky One! Probably “The Help”. Looks great. Definitely “Under the Dome” by Stephen King. I’ve been wanting to read that! I would download I Am Ozzy. Pride and Prejudice would have to be the first book on a new Nook in my house! Shutter Island! Love it, thanks! The first book that I will download is Dead and Gone by Charlaine Harris. I would choose the Shutter Island book first. by Chelsea Handler..I think she’s hilarious! Advertised this giveaway here (#251) http://www.themomreviews.com/2010/03/looking-for-giveaways-link-up-every_16.html? Carnal Innocence would be the first book I would download! first book would be “The Contortionists Handbook” by Craig Clevenger. It is amazing. I would download a bunch of Nora Roberts books – I really love her old ones too – but the wedding planners series is good for what is new to get. I would download The Lost Symbol by Dan Brown. The first book I download will be “The Hour I First Believed” by Wally Lamb. It’s 700 pages long and huge to carry. Would love to have it on a slim Nook! I’m a new subscriber to your blog. Thanks! I would download Audrey Niffenegger’s most recent book, Her Fearful Symmetry. Thank you! I would download “sookie dairies” as my first book. I would download The Count of Monte Cristo. My first book would be “Santa Olivia” by Jackie Carrey. I would get the Anne Tyler book. The first book I downloaded would be Saving CeeCee Honeycutt by Beth Hoffman. Stephen King-Under the Dome would be the first book that I would download. I would love love love to win a Nook. I’d download Flirt by Laurell K Hamilton. I’d download The Curious Case Of Benjamin Button. It would have to be the stand by stephen king. I’d probably get a copy of Grimm’s Fairy Tales. We actually don’t own that and I think it would be great to read w/ my kid. I would get Impact by Douglas Preston. Thanks! I would download, South of Broad by Pat Conroy. I would download “Shutter Island” first thing. “The Blind Side” would be second. The first book I downloaded would be Last Night in Twisted River by John Irving. The first book I would download would be Noah’s Compass by Anne Tyler. I love her books. I would love to read Julie & Julia before I watch the movie!! I would download The No. 1 Ladies’ Detective Agency. Great giveaway! I would download the Twilight Series! I’d love to win a Nook, because I love to read books. The first e-book I would download if I won the Nook would be Fantasy in Death (In Death Series #30) by J.D. Robb. I absolutely love her books! I would download The Lightning Thief (Percy Jackson and the Olympians Series #1) for my son and I to enjoy together. I want to read “I Am Ozzy”. I’d download The No. 1 Ladies’ Detective Agency (The No. 1 Ladies’ Detective Agency Series #1) – I’d like to see if this is a series for me! If I won, the first book I would download would be A Reliable Wife by Robert Goolrick. It sounds good. the first book I’d down load would be Twilight. The first book I would dowload would be “The Man You Will Marry”, by Debbie MacComber. I love her books. I would so love to win this. Thank you for the awesome giveaway. I follow you on Twitter (nanatide). thanks!! Pirate Latitudes by Michael Crichton! I am an email subscriber. Thanks again! I’d choose to download The Murder of King Tut by James Patterson. I like nonfiction and true crime! The first would definitely be the Lovely Bones. Thanks for the chance. I would get a copy of The Dark Night of the Soul (Barnes & Noble Library of Essential Reading). I want an eReader so badly!! My first download would be The Girl Who Chased the Moon by Sarah Addison Allen because it looks so interesting and I’ve heard great things about it. Shutter Island by Dennis Lehane I Want to read this SO bad! i would download new moon… i’ve been waiting for it to be returned at the library forever! I commented on the “Why My kids Love the New Frigidaire Double Door Fridge” post. Stieg Larssen’s The Girl Who Played with Fire – I love the first book, and I haven’t gotten the second one yet! I am subscribed to your blog via email already. I posted this on my FB page (http://www.facebook.com/profile.php?id=173701584&ref=nf) my profile is private, so I’m not sure if you can see it. The first book I’d download would be Steig Larrson’s The Girl Who Played With Fire. What a great giveaway. Thanks for the chance. Probably Ananthema by Neal Stevenson. Thanks! The first book I would buy is Woman on the Edge of Time by Marge Piercy. It’s one of my favorites but I don’t own a copy. I would love to get the Fablehaven e-book series for my daughter. I would download either Wench by Dolen Perkins-Valdez or Noah’s Compass by Anne Tyler. I would download “Leaves of Grass” by Whitman….it’s my favorite book, and it would perfect to be able to have it on the nook! Winter Garden by Kristin Hannah. I would download The Help by Kathryn Stockett. Thanks for the great giveaway! My first book purchase would be a gift for Mark. A gay romance. I posted about your giveaway on my facebook page. I would download Never tell our business to strangers. I’ve been getting into more non-fiction lately and this looks interesting! I’d love to read Food Rules by Michael Pollan. I would download The Body Finder by Kimberly Derting. posted on facebook again today. can I do that only once? I would download Dan Brown’s The Lost Symbol! I love stuff like this to read! I would first get A Reliable Wife. Food Rules by Michael Pollan. The first book I’d download would be Beth Moore’s So Long, Insecurity. I could feel so much more secure reading it on a Nook! For me, it would be the Blindside. Thanks for the chance. I would read My Life in France by Julia Child and Alex Prud’Homme! I would download Jodi Picoult’s latest. My first download? I would have to check to see if something came in a bundle. Who can read just one book? More than likely I would pick Lover Mine by JR Ward because I have waited a year for this book and I only have a few more days to wait.